Now this is a track I can picture in my mind! Growing up in rural Australia means that songs like this classic really speak to my heart. Sometimes music these days is just a bunch of utter rubbish where people sing nonsense lyrics that some other bugger wrote for them to make them another million bucks. Let's wind that clock back a bit and check out some lyrics from an Australian classic. the gum trees ahead (to the right). 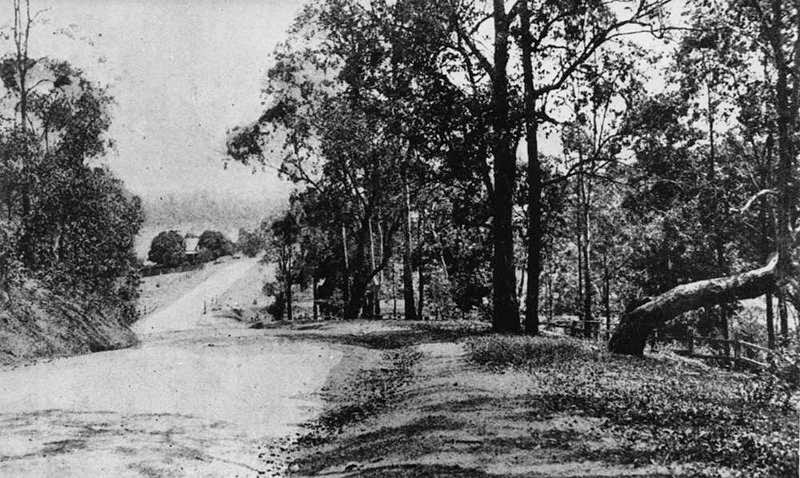 Moggill Road, Indooroopilly, Brisbane 1921. Along the Road to Gundagai was written way back in 1922 by a true blue Aussie bloke tickling the ivories in a Melbourne music store. Jack O'Hagan worked for Allans Music store (which is still around today!). He was a talented musician who played the sheetmusic that customers were interested in buying. In the meantime, this young'n was crafting a little masterpiece of his own that would eventually become an Aussie favourite. Check out the lyrics and we'll discuss what some of the more obscure phrases mean. I dunno about you, but I reckon that's gold. Jack obviously had a love for the countryside and the simple things in life, like his old family shack, the big Aussie gum trees and his schoolmates. Those are the things memories are made of, ay? Jack's mate, Peter Dawson, recorded this song a couple of years later. The song sold around 50,000 copies in 3 months and both blokes probably made a motza! Have a listen to Peter Dawson's recording. Sing along if you want to! I hope you enjoyed this Aussie classic. I'll end with an explanation of some of the lyrics used. Feel free to comment below and ask me any questions about other words you don't understand. Til next time, see ya! Ay: often used at the end of a sentence, meaning "don't you agree?" That's really a great post. I would like to thank you for the efforts you have made in writing this article.Thanks for sharing this..